The Maple Leafs were able to delay their unofficial end of the season a game longer when they beat the Bruins 4-3 in the shootout behind Joffrey Lupul‘s two goals and Phil Kessel‘s two-assist night. The Maple Leafs took the season series with the win and kept their mathematic playoff hopes alive. After a slow start the Leafs broke through with a weird goal seven minutes in. An innocent pass was thrown across the Bruins zone and deflected off of Tomas Kaberle and into the back of the net. Luke Schenn was attempting to pass to Phil Kessel on the doorstep but hit Kaberle’s leg instead, the puck caught Tim Thomas going post to post and helpless. The goal seemed to wake the Bruins up, the team rallied off four straight shots after the goal but then took the game’s first penalty when Tyler Seguin was sent off for hooking. The Bruins killed off the penalty but were penalized very soon after when Steve Kampfer was sent to the box. Towards the end of the power-play Kessel got in a shoving match with Andrew Ference which gave the Bruins their first power-play. The Bruins power-play didn’t get anything going at all but the penalty parade continued right after the penalty expired, giving the Bruins back-to-back power-plays. The second Bruins power-play would look a lot better but failed to properly handle themselves in the last half minute and took a 1-0 deficit into the room. The penalty’s continued at the beginning of the second when Zdeno Chara was called for hooking 40 seconds in. Brad Marchand would knot the game at 1-1 when he stole a puck in the neutral zone, fought off a defender then made a move towards center and flipped the puck backhanded past James Reimer for a shorthanded goal. Marchand’s unassisted goal started at the red line and was a great display of his speed, balance and skill. The Bruins would score less than a minute later when David Krejci put in a chance in the crease. The Bruins broke out after a shot block in their zone. Nathan Horton wheeled to Milan Lucic on the left side who got Reimer to bite before dishing to Krejci in the center. Krejci then put a shot off of Reimer’s skate and in, the Bruins second goal in 59 seconds was a crisp display of passing in the offensive zone. The Bruins lack of discipline would rear its head once again when they were put on the penalty-kill for the fourth time in the first half of the game. The Leafs would make them pay when Joffrey Lupul tapped home a pass from the top of the paint. 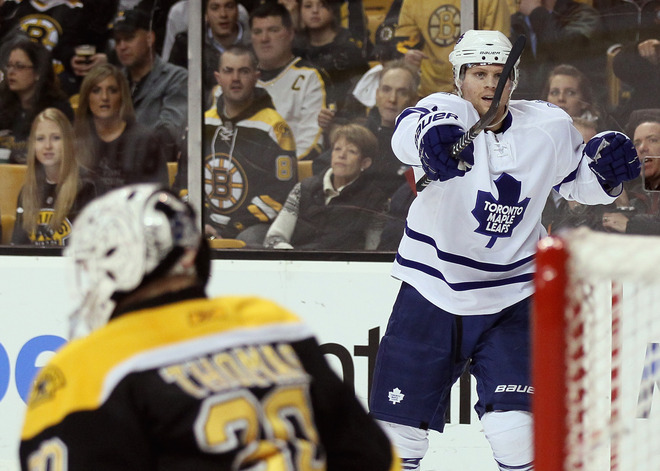 Kessel got the puck in the corner and quickly wheeled it out front where the Leafs outnumbered the Bruins 2-1. Lupul edged off Adam McQuaid and got the puck off his skate, beating Thomas five-hole. Andrew Ference would take the lead back when a harmless looking shot from the point beat Reimer five-hole. The Bruins counter-attack was broken up at the blue line but Ference unloaded the puck on net, catching Reimer flat-footed. The goal was the Bruins third in four shots in the second period. The Bruins would get another power-play quickly after. The Leafs survived a chaotic penalty-kill with James Reimer making some big saves under duress and redeeming himself quite nicely after a horrific start to the period. Lucic would drop the gloves late in the power-play after a post-whistle scrum. Jay Rosehill jabbed away at Lucic but the two had a very good, very long bout. The Bruins got the game’s next power-play which threatened but couldn’t get a goal. The Leafs would get a power-play with under two minutes left in the second period, giving them a chance to tie up the game despite a dominant period by the Bruins. The B’s would kill off the majority of the penalty to kill off the remainder of the period. The Leafs came out with a very determined effort to start the period, shoring up their defensive zone and showing a more consistent attack. The Leafs would tie the game up eight minutes in when Joffrey Lupul beat Thomas top corner on a wicked shot from the slot. The Bruins turned the puck over in their own zone in a bad spot. Lupul was able to fire a shot on net in stride, catching Thomas off guard and beating him with a shot glove side high. The Bruins would battled back from a poor start and got their heads back in the game with a few strong shifts at the middle of the third period. From here on the game had a crazy back-and-forth pace with Toronto desperate for two points and the Bruins looking to seal up the three seed. A frantic finish the teams went to overtime. Tim Thomas made a huge save early on in overtime on Mikhail Grabovski but Grabovski was awarded a penalty shot in the first minute of overtime. Grabovski wound down the lane slowly before deking forehand and getting stuffed on the pad of Thomas. The Leafs dominated the first four minutes of overtime but Lupul was sent off for slashing behind the Bruins net with 1:05 left in the extra frame. The Bruins took a timeout to discuss strategy on the shortened power-play. The Bruins couldn’t manage a clean shot on Reimer with a lot of Toronto shot blocking down low killing out the remainder of overtime. In the shootout the Bruins went first, bringing out Seguin. Seguin tried to pick top glove side but missed high. Kessel was first for the Leafs went wide and shot glove side but missed. Michael Ryder was second for the Bruins and snapped off a shot but missed high. Nazem Kadri was second for the Leafs, stick faked a bunch of times then went backhand at the last second, beating Thomas high glove side. Pevereley had to score but was stopped by Reimer’s glove, giving the Leafs the 4-3 SO win. The Bruins play Atlanta Saturday.